When Calvin visits his cousin Eric in Northern Canada, he makes a fascinating friend - Willis, a young Ojibwa guide. 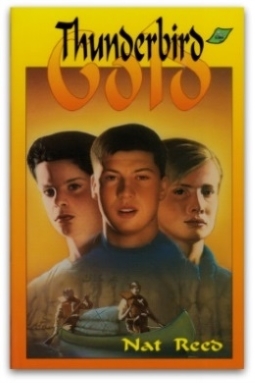 Calvin, Willis, and Eric join in a canoe trip to study Indian pictographs, and before long they're involved in a mystery that leads them into breathless adventure and the unravelling of an ancient legend. The monotone hooting became more and more insistent. Calvin and Eric watched as Schmidt and his partner pushed themselves out of their sleeping bags and crept to the window on the far side of the house. "I don't like this. I just don't like this," one of them whispered horsely as they reached the window. "You got your gun?" All at once Calvin heard the flashlight clatter on the floor and a shrill scream. "It's a ghost! I told you this place was haunted!" Schmidt's partner bolted for the door of the house. "Wait!" Schmidt said, going after him. "It can't be -"